In Australia it is considered to be the fastest growing horticultural industry. The trees can produce fruit as early as 3 years but can take up to 12 years. Olive oil is recommended to be a healthy substitute for other fats and is actually considered to be a fruit juice. The trees are beautiful to look at and as there is no bark or leaf shedding they don’t make much mess. They are hardy plants that are able to withstand storms, drought, frost and salt water. 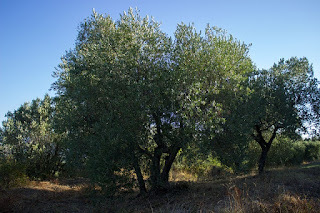 The olive tree as a gift symbolises joy, peace and happiness. It is believed that olive trees can have a possible lifespan of 2,000 years – wow! Now that is an investment into the future generations! · I can be like an olive tree, with my roots buried deep down into God’s love I am made strong - Ephesians 3:17. · I am contunally growing in my faith (with a rapid acceleration experienced over the past 11 months) - 2 Corinthians 10:15. · I have produced small amounts of fruit in my life but I long to produce much much more – John 15:5. · Jesus is the best substitute I’ve found for anything - Acts 4:12. · God is making something beautiful out of me and I’m relying on Him more and more so that I don’t make a mess of things - Ecclesiastes 3:11. · My strengthening faith is enabling me to withstand the storms of life, I can endure what the world throws at me because God is my strong tower of refuge - Proverbs 18:10. · Because of Jesus I can bring joy, peace and happiness to the lives of others – through the fruits of the spirit: love, joy, peace, patience, kindness, goodness, faithfulness, gentleness, and self-control - Galatians 5:22-23. · The efforts that I make today can leave a lasting legacy for the generations to come - Psalm 105:8. Today I pray that you’re strengthened to face the storms that rage around you. I pray that you can make wise decisions that bring spiritual prosperity, for this will carry on into the generations to come. It's amazing to think that a tree can begin producing fruit in as little as three years, yet last 2,000! I guess you could say the same about Jesus - he had three years of earthly ministry that has lasted 2,000 years. Great comparison, Keona. Thank you.